WoodUFinish.com believes the sale ends when the customer has a beautifully finished piece of furniture. We know accidents happen or sometimes it just wasn't the color you thought the stain would be, and we want to help you make it right. WoodUFinish.com will replace any piece of furniture within 60 days of being bought at WoodUFinish.com for FREE if you are not happy with your finishing job. This offer is valid only if using ZAR staining/finishing products purchased from WoodUFinish.com. 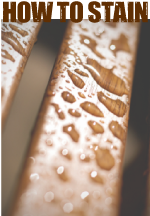 ZAR staining/finishing products are the highest quality available and make it easy for even the most inexperienced wood worker to stain their furniture flaw free. Receive a return authorization number via e-mail. Send the piece you wish to exchange back to us with shipping pre-paid with the RA number on the box. We will then charge your account for the return shipping and send your NEW piece of unfinished furniture back to you. WoodUFinish.com does not guarantee all pieces will be in stock, some delays may occur as a result. By checking this box, I agree with the WoodUFinish.com return policy.